The rapid influx of renewable energy projects coming online implies pricing and dispatch patterns for the utility companies who are integrating them will be increasingly influenced by the variable nature of wind and solar. That’s definitely a scary thought for most. There is little doubt as to the many benefits of renewable energy consumption. If you’re in need of yet another data point, consider these statistics: renewables represented approximately 58.5% of net additions to global power capacity in 2014, according to the REN21’s Renewables Global Status Report. The significant opportunities found in renewable energies far outweigh the challenges of utilities integrating renewables onto the grid. A growing number of utility boardrooms are discussing ‘Smart Generation’ alongside the more standard energy generation formulas like availability, reliability, efficiency, low emissions, safety and affordability. To manage weather’s unpredictability, electric utilities are turning to smart grid technologies, explains Schneider Electric in its new book “Powering an Always On World”. One key fact to understand is ‘smart’ should equal ‘flexible.’ Flexible energy generation is done by ramping up or down as demand fluctuates or by quickly changing ‘state’ from cold (inactive) to hot (active) or vice versa. The goal, at all times, is to fill the remaining demand gap for electricity. However, introducing flexibility into the generation model can drive up costs by running plants less efficiently below optimal load factor, and by placing more strain on physical equipment due to frequent up and down power output requests. Flexibility is a key factor in grid operation. Utilities that wish to participate in the large-scale adoption of renewable energy sources should understand smart generation and the Smart Grid to implement a new model of operation, one where the load follows the available generation. Today utilities must become Smart utilities. Those that succeed will opérate efficient Smart grids, decarbonise their generation portfolio and provide new energy customer services. 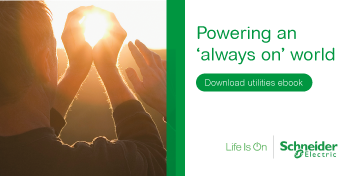 Find out more in our “Powering an always on World” ebook to discover how Schneider Electric`s energy experts tell the story.